The head of the local branch of the international auditing firm Ernst & Young was elected to chair the European-Czech Forum. The organization focuses mainly on lobbying and promotion of good business relations. This mezzosoprano is the first Czech to receive the prestigious “Artist of the Year” title from the British magazine Gramophone. She also impressed with her new album “French Arias”, which was declared the best recital and with “Songs”, which was named the best vocal recording. The former head of the Philips local branch and director for central and eastern Europe of Philips Medical Systems joined Accenture Services. As head of the Prague center, he will oversee accounting and administration services for many global clients. At a meeting of EU justice ministers in The Hague, the Czech minister missed the discussion on European arrest warrants and a presentation of Czech priorities in the field of justice for the next five years. Instead he went out for coffee with his girlfriend. Not only did Aero Vodochody lose 16% of its turnover last year – but the Taiwan Aerospace Industrial Development Corporation recently ended its cooperation on the production of the Ae270 Ibis plane. According to the general director, the valuable project may not be realized at all. In 2001 the ODS deputy advised the budgetary committee (which he chaired at that time) to approve a construction of an aquapark in the village of Bublava, which failed to be completed. According to the National Control Authority, the project swallowed CZK 57 million, which came from the state budget. MONIKA GOLKOVÁ (30) is a glowing example of a woman who’s managed to combine a career with motherhood and enjoy both immensely. Paradoxically, the births of her two sons – today 3 and 1 1/2 – started the doctor’s business career. Following a brief stint in neurology at Thomayer Hospital, she didn’t hesitate to give up the certainty of a steady income and go into business. “I was looking for a way to be the master of my time so I could devote myself to my children and my career,” this energetic woman says. This May she opened Aura medical clinic, a private center in Žižkov, in which she owns a majority stake. 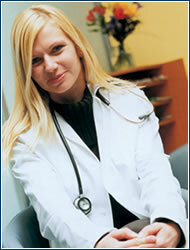 The clinic provides comprehensive patient care, emphasizing a pleasant environment and a personal approach. “This sets us apart from most state-run clinics,” Golková says. “A client needs only to make a phone call to spend a whole day at our clinic, starting with preventive examinations, through dental work, to rehabilitation. No lines, and everything under one roof,” she explains, adding that the clinic’s flagship is hair transplants without surgical incisions and anti-aging treatments. The polyglot team can satisfy patients’ ethical, religious, and national requirements. The clinic is trying to close contracts with Czech insurers, but for now it’s doing better with foreigners – the American insurer Signa pays their bills. “About all of Radio Free Europe comes to us,” she laughs. Her greatest wish is that all the patients leave the clinic satisfied, and she’s doing all she can to this end. Because of her work load she has given up her hobbies for a while – tennis, polo, and body-building. 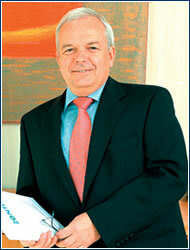 THERE HAS BEEN much talk recently about Jiří Michal (53), who heads Zentiva, N.V. In June 2004 he roiled the stagnant waters of the Prague Stock Exchange, when Zentiva (formerly Léčiva) successfully issued its shares in Prague and London, and Michal, who owns 10% of the company’s shares, suddenly joined the ranks of Czech billionaires. His ties to Zentiva, which he has been running for 14 years, date back 30 years. He joined the firm immediately after graduating from the Institute of Chemical Technology in 1974, starting as a systems engineer. “At that time I could never have imagined eventually becoming the director here,” he says modestly. He brought the company through transformation and privatization, and made it number one on the Czech pharmaceuticals market. Owners changed (it’s now registered in Holland), but Michal remains. “Michal is Zentiva, and Zentiva is Michal,” his colleagues say. They see him as a leader who is gradually building a major European firm. How is he doing? “He assembled a team of well educated, creative people, he’s bringing foreign ‘brains’ to Prague, and he’s able to motivate people,” says spokesperson Věra Kudynová. One-on-one, this graying man appears modest, even nondescript. He’s different at work. “He’s very charismatic, witty, and self-assured. Managers learn things from him they’d never learn in school,” Kudynová explains. However, this father of two grown children doesn’t make a big deal about his successes. “I don’t like people who talk about all they’ve sacrificed to achieve this or that,” say Michal. “I try to live my life with three basic values balanced: family, work, and hobbies. This makes me feel free.”.